From the guest list to choosing the dinner menu, wedding planning is full of serious business to take care of. But since your wedding day is all about having fun and making new memories that will cherish for years to come, it’s important to hire the right entertainment to create a fun-loving and enjoyable atmosphere. An entertainer can add a dose of humor and personality to the day to make it an unforgettable event. Don’t be afraid to stray away from the traditional DJs or pianists. There are many varieties of entertainment out there, ranging from celebrity impersonators to caricature artists that can match your mood and tastes. From the big band tunes and romantic melodies Frank Sinatra to the impressive, hip-shaking moves of Elvis Presley, you can keep your guests on the dance floor all night long. With a wide range of celebrity impersonators out there who can bring the fun and the star power to your special day, you can choose one that matches your style and musical tastes. A popular option for weddings is having a photo booth where guests can capture memories of the day. To take the traditional photo booth a step further, try a green screen photo booth! This screen allows guests to choose any background from the beach and tropical themes to movie or entertainment themed backgrounds to match your wedding theme. This adds a unique touch to your photos and offers endless photo possibilities! Classical piano music is a beautiful accent to any wedding ceremony or reception. You can take your piano entertainment up a notch by hiring dueling pianists. Dueling pianos are a great way to bring laughter and fun to your wedding reception. 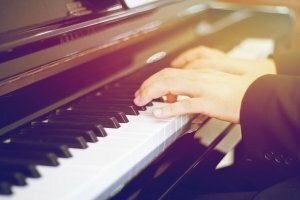 Pianists can take song requests and tickle your guests’ funny bones, keeping guest singing along and having a good time. If you go this route, be sure your venue has adequate space to accommodate the pianos. A caricaturist can create fun and unique portraits of your guests for a lasting keepsake they can remember your wedding by. On average, an expert caricaturist can create up to 15 portraits for your guests an hour. Options like custom paper can also help to commemorate your big day. With a strolling table or living table, you can present drinks or hors-d’oeuvres to guest in a unique and impressive way. Strolling table performers, who are typically experts in living statue performance, dress in elaborate and flashy costumes with a cage or flat surface that is built around their form. This unique performance also creates fun photo opportunities for your guests. Entertainment Unlimited offers all of the above entertainment services and more! We offer a wider range of entertainment services with packages to meet your needs and your budget. Contact us today to learn more about our entertainment options and let us help you add a unique element to your wedding entertainment!